We're always on the lookout for sources of fine equine sculpture. Click here to view an attractive selection we'd like to share with you. Horse statues and equine sculpture have always had great appeal. Sculpture has been a means of human expression since prehistoric times. Findings of ancient Egyptian, Babylonian, Asian and pre-Columbian American art indicate that these works had both aesthetic meaning and ritual significance. The free standing and relief sculpture of the Greeks and copied by the Romans replaced the more rigid ancient forms, and subsequently becoming inspired medieval European art and into the Renaissance. The realism of Renaissance art led in turn to the expressionism found in contemporary horse sculpture. Both art styles are evident in today's horse sculpture. Here's a small metal statue from a souvenir shop. Inexpensive but still kinda cute. Nice gift. Here's one for the front yard -if you have a big front yard and you don't mind a horse with a guy sitting on it. Not for sale though. Like terra cotta? Here's a whole army. These famous statues from China are very definitely not for sale. The statue at the top of the page is a replica of da Vinci's Il Cavallo of which several life-size reproductions have been cast in recent years. Il Cavallo - the Ultimate Horse Gift? Possibly, but your horse lover likely would prefer a statue somewhat smaller in size. Something that would fit nicely on a desk, bookshelf, or table top. Liberty Bronze Stallion This most impressive statue presents a noble stallion in a powerful pose. 11" x 3 3/4" x 13 1/4" high. Spun glass carriage with horses and coachman. Reminiscent of classical Greek statuary, this noble stallion is shown with stunning accuracy. and the look of a time-honored antique! Aluminum. 5 1/2" x 9 1/4" x 11" high. Find Out More Horse’s Head Bookends for the horse-lover. Flowing manes blend into waves at the base. Crafted in alabastrite with a deep bronze finish. 4" x 4 1/2" x 6" high. GIFTSPRINGS has a very large selection of gift ideas. On their "Horse Home Decor" page you'll find an attractive selection of horse statues crafted from alabastrite, glass, wood, bronze, and the deep red stone found in China, Hong Tze. 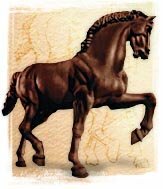 We're of course always on the lookout for sources of fine equine sculpture and have found a wide range of horse statues in the Back In The Saddle On Line Catalog for Horse Lovers. They have a wide range of sculpture to offer. Besides statues, you'll find wall art, bookend sculpture, a selection of Breyer horse models and the popular Trail of Painted Ponies. 0 A suggestion - while visiting BACK IN THE SADDLE's website, send them an e-mail requesting their catalog. You'll enjoy it, and the quality of what they have to offer shows, and in browsing through it you'll get a warm feeling as far as shopping with them is concerned. An alternative to a horse statue of sculpture as a gift idea would be a photograph of one. There are a number of attractive photos on the market or you could give a fantastic photo you took yourself. Here's a few photos I took during a recent trip to Copenhagen, Denmark of three Kings on Horseback. I'm sure you can do can do better but you get the idea. If you have in mind horse statues and sculpture by Frederic Remington or Charlie Russell, or limited edition works by one of several contemporary western-style artists it would be worth your while to view THE BRONZE WORKS' Gallery. Many thanks to Emile Spaanbroek - Dordrecht, Netherlands for permission to reproduce Qin's Terra Cotta Statues on this page.